"High and hoar on the forehead of the Jettenbuhl stands the castle of Heidelberg. Behind it rise the oak-crested hills of the Geissberg and the Kaiserstuhl; and in front, from the broad terrace of masonry, you can almost throw a stone upon the roofs of the town, so close do they lie beneath. Above this terrace rises the broad front of the chapel of Saint Udalrich. On the left stands the slender octagon tower of the horologe; and, on the right, a huge round tower, battered and shattered by the mace of war, shores up with its broad shoulders the beautiful palace and garden-terrace of Elizabeth, wife of the Pfalzgraf Frederick. 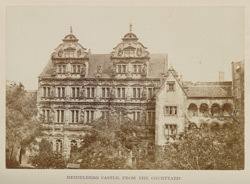 In the rear are older palaces and towers, forming a vast, irregular quadrangle; Rodolph's ancient castle, with its Gothic gloriette and fantastic gables; the Giant's Tower, guarding the drawbridge over the moat; the Rent Tower, with the linden-trees growing on its summit, and the magnificent Rittersaal of Otho Henry, Count Palatine of the Rhine, and grand seneschal of the Holy Roman Empire."